Our homeschool focuses on neat handwriting while learning the Faith. These handwriting books were made especially for my children and we hope that you will enjoy them too! Below you will find many files to download for free. All of these files are copyrighted by Crusaders for Christ. Copyright - The purpose of this website is to share the beautiful Catholic resources that God has so richly blessed us with. All texts--unless they are my own words--have their sources quoted, and most of them are in the public domain. Any educational items that I have made for or with my children are NOT TO BE USED FOR PROFIT, but are meant to be used for personal use by individuals and families. In other words, "Thou shalt not steal." If you would like to share these files please provide a link to our website. Thank you and God bless you! All Rights Reserved - No part of these books may be reproduced other than for personal home use. Below you will find the files to Our Daily Guide both in printing and handwriting practice files. If you wish to print this as a booklet that you can fold in half and staple in the center, print the cover first by itself and then set your printer to print both sides for the rest of the pages. The Angelus handwriting practice. There is the history of the Angelus and then the handwriting practice. This is a 1/2 sheet booklet. It should be printed on both sides of the paper, folded in half and stapled in the middle. Note: Print the cover first by itself and then set the printer to print pages 4-11 double sided. To Honor Saint Joseph handwriting practice. This handwriting book includes the Litany to Saint Joseph, Prayer for Holy Purity, Prayer for a Happy Death, Ejaculations and Memorare to Saint Joseph. Feel free to print and use it for your own family. Saint Joseph, patron of the Universal Church, pray for us! The Litany of the Holy Name handwriting Practice. Children can gain great graces by saying the Holy Name of Jesus while working at this handwriting project. Feel free to print and use this project for your own family if you would like. The Litany of Loreto or the Litany of the the Blessed Virgin Mary handwriting practice. Children can learn this lovely prayer in honor of Our Lady's beautiful titles while practicing their handwriting. Feel free to print and use this project for your own family if you would like. Handwriting With the Saints is for older children who don't need guidelines that show them how to form their letters. It was put together to fulfill the need of my handwriting loving children. It is meant to be printed on both sides of the paper so that when it is open the text that is to be copied is on the left and the lines on which to copy it are on the right. Feel free to print and use this project for your own family if you would like. I would like to share with you another project I put together for my 7 year old. 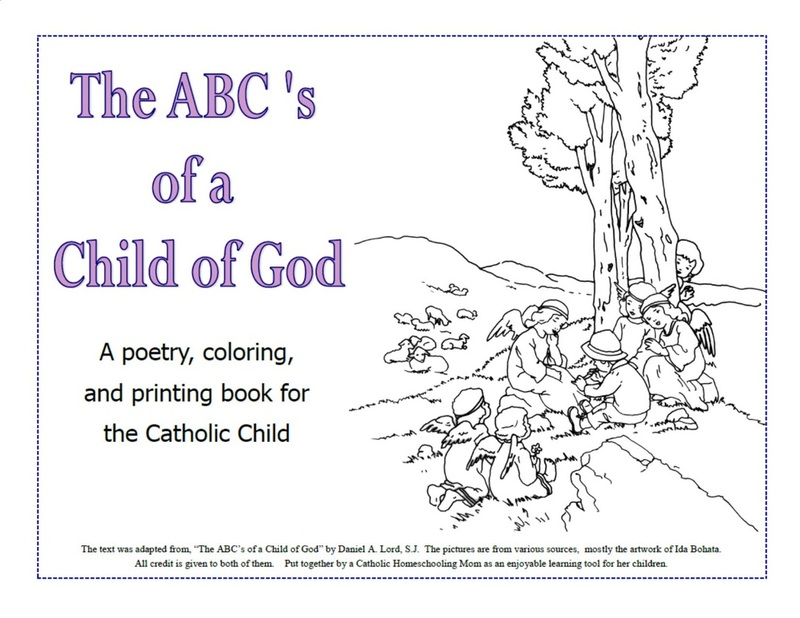 A printing practice book using the Saint Joseph Baltimore Catechism. Feel free to print and use this project for your own family if you would like. All text in this handwriting book is Taken from a book titled, “Songs for Catholic Schools and The Catechism in Rhyme” 1862. It was originally written as a way to “convey religious instructions to the young. The singing or chanting of such rhymes causes them to be learned quicker, and impresses them more deeply on the memory.” It is with these sentiments in mind that I put this together as a handwriting book. In the hopes that it too would help impress upon the child’s memory the Truths of our Glorious Faith. This little project came into being because of my love of Catholic poetry and because I have found through my years of homeschooling that what is taught in Rhyme is committed to memory better. So with that in mind I’d like to share with you this latest handwriting practice book. It is a story, poetry and handwriting book in one. The well known Latin hymn, Stabat Mater Dolorosa, tells of the emotions of our Blessed Virgin Mary at the foot of the Cross, The author of the hymn is uncertain but by the end of the fourteenth century it was well known by all classes. There are over sixty translations into English (in whole or in part). Amongst the translations are those of D. F. McCarthy, Aubrey de Vere, and Father Tabb. (source: Catholic Encyclopedia, 1918) Because of these translations there may be a variance between the version in this book and others you may have seen. Although there are 20 stanzas it is commonly sang during the Way of the Cross using only 14 or 15 of them. All 20 are included in this book. This handwriting book tells the story of Our Lord's life on earth in 35 lessons. Each contains a story and poem for copy work. Taken from a wonderful book by Grace Wallace Doonan, Imprimatur of 1913. This workbook is geared for preschool aged children. It gives the child practice with letter recognition and printing practice as well. 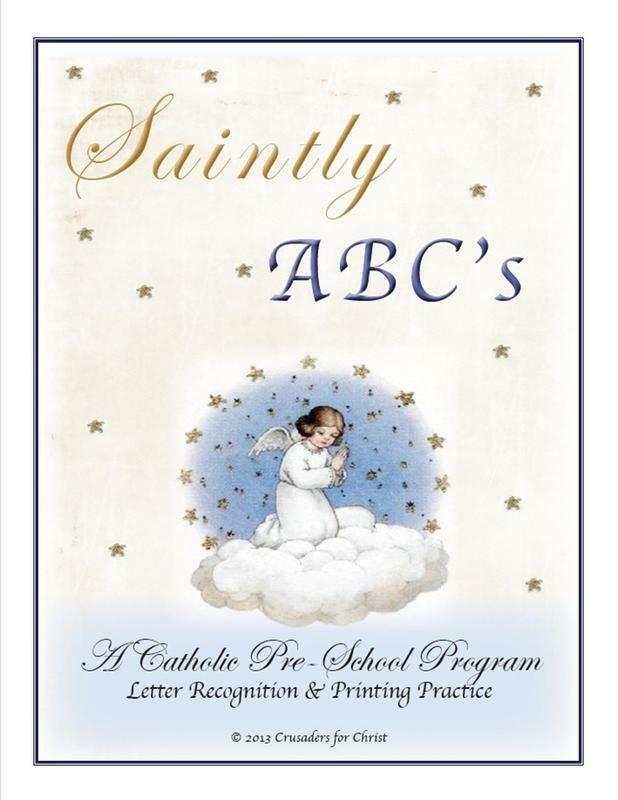 Each letter contains a saint's coloring page, some short reading and/or rhyme and space to practice writing the letter. There is no certain way to use this program, as all children learn in their own unique way. I plan to use it with the Little Angel Readers when teaching my 5 year old. You can use it in whatever way suits you and your child best. The following files are meant to be printed on both sides of the paper and folded down the center. The Mysteries of the Rosary Files are meant to be printed on both sides of a sheet of paper and folded down the center. To print the Hail Mary handwriting, printing or copybook. Print on one side of the paper, cut down the middle, put in order and staple. Please note: The Act of Contrition and Spiritual Communion files are meant to be printed on both sides of the page and folded in half width wise, so it ends up about a 4x6 page. To print the Our Father handwriting, printing, or copy book, select to print the odd pages first and then reinsert those pages and select to print the even pages. Fold in the center and staple.